“We have had an incredibly successful start to the development with lots of visitors coming from Haydon Bridge and the surrounding villages, said Bellway’s Sales Advisor, Diane McDonough. 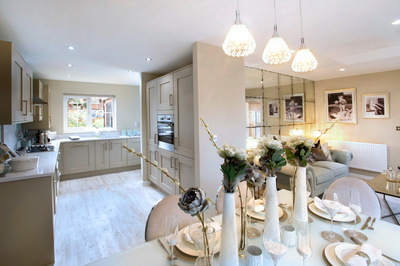 “Visitors will be able to see the wide range of homes we are offering at Showfields which start in price from £124,995. Amongst the homes available are a collection of two, three and four bedroom homes in a variety of styles which offer a range of different floor plans to suit peoples living needs. “As well as the stunning countryside including access to many walks along Hadrian’s Wall buyers can enjoy a variety local catering including three traditional village pubs all within 10 minutes’ walk of Showfields, or for fine dining steeped in history, Langley Castle Hotel is less than two miles away. Hexham, too, is home to a variety of cafés, bars and restaurants,” confirmed Diane. Visitors to Showfields will be able to sample the living Standards that Bellway is offering when they view Bellway’s four bedroom Aspen detached show home which provides 1,288sq ft of living space and features an open-plan kitchen, dining and family area, a separate living room, a garden room, or study and an en suite to bedroom 1. The development will appeal to a wide variety of buyers, including families, first-time buyers and professionals. All the properties incorporate modern design features – such as open-plan living areas, en-suite bathrooms and some built-in kitchen appliances – and are finished to a quality specification. Externally, all have gardens and parking, while 3 and 4-bedroom homes also have garages. For families, Haydon Bridge has both a primary and a secondary school, while a number of well-regarded schools can be found in nearby Hexham. For further and higher education, Northumberland College has a campus in Hexham, while the nearest universities are in Newcastle upon Tyne around 28 miles away and in Carlisle 30 miles away. Buyers will be able to take advantage of the Government’s Help to Buy scheme which only requirers a five percent deposit they can then take advantage of a 5 year twenty percent interest free Government loan which reduces mortgage repayments during the first five years of ownership. For families with an existing home to sell, Bellway can help you move using their free of charge Express Mover scheme where Bellway will appoint an estate agent on your behalf who is focused upon achieving a quick and satisfactory sale of your old home. For more information about Showfields visit bellway.co.uk. Our sales office is open 11:00am – 7:00pm Thursday and 11:00am – 5:30pm Friday to Monday. Closed Tuesday and Wednesday.